Hi In this post we will discuss what is SQL Injection attack. and how its may affect ur any web application its use the backend database. Here i concentrate on java web application. Open Web Application Security Project(OWAP) listed that SQL Injection is the top vulnerability attack for web application. Hacker's they Inject the SQL code in web request to the web application and take the control of backend database, even that backend database is not directly connected to internet. 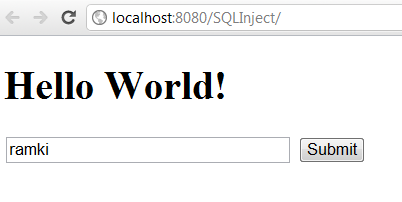 And we will see how to solve and prevent the SQL Injection in java Web Application. For this purpose we need 1 tools. these tool are completely open source. SQL Map - SqlMap is an open source penetration testing tool that automates the process of detecting and exploiting SQL Injection. we can get it from here. 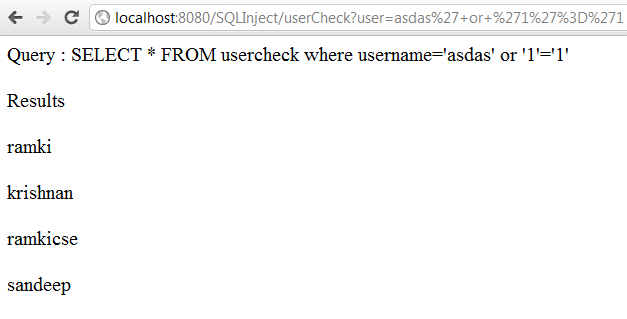 In userCheck Servlet receives the user input field and connect to databse server and fire the sql query based on user input and receive the ResultSet and iterate it print into the web page. when i enter normal value in input box my servlet receives and substitute in the sql query and execute it. its correct and we got correct output. like this. so our query is altered. now new query have 2 condition. 2nd condition always true. 1st condition may be or may not be true. but these 2 condition are connected with or logic. so where clause always true for all rows. the result is they bring all rows from our tables. here they wont use * because its not matched with first table. so they find how many columns then use Union with second table.the user particular column they want . as result the get mysql database user information its exposed through our web application. Here I used backtrack linux. because its already pre installed lots of applications like sqlmap. When we use JPA kind of ORM tools like Hibernate, EclipseLink, TopLink that time also may be sqlinjection is possible. 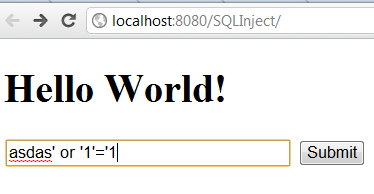 Preventing the SQL injection we need to use NamedQuery instead of normal Query. Because NamedQuery internally used PreparedStement but normal query used norma Stement in java.